I'm a big believer in having style with comfort. My last few days have consisted of pre-sunrise city commutes and back-to-back seminars, which calls for some creativity in terms of outfit selection. Do I wear the pumps and risk limping home? Should I go with the flattering pants that might be a size too tight? For those of you who ride the struggle bus when choosing a work outfit that will last all day, this is for you. I call it pajama chic. Your work outfits don't have to be limited to restrictive pencil skirts or trousers. 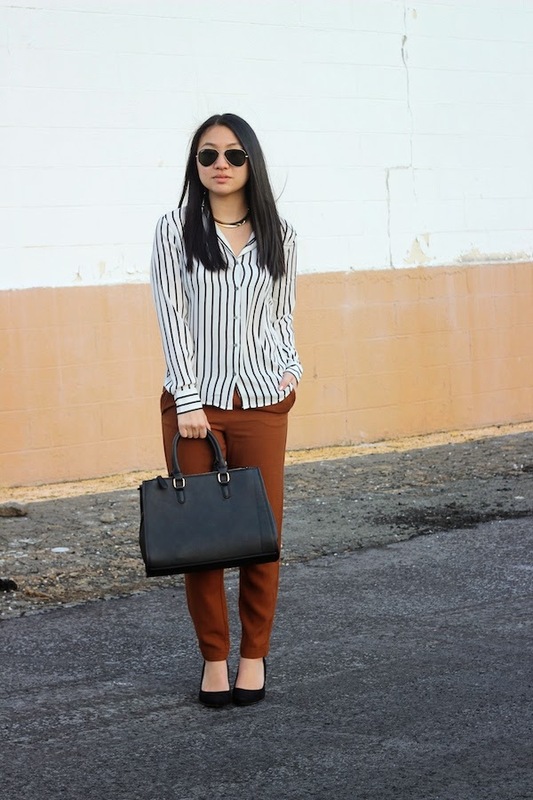 Loose-fitting pants like these are perfect substitutions for the office when paired with other elements of professionalism. 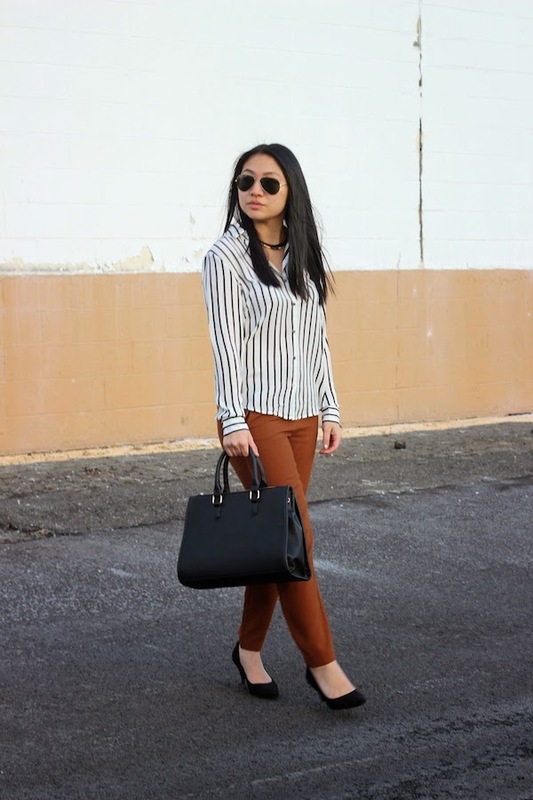 The additions of a button-down blouse and lower-heeled shoes instantly create a balanced look that is both work-appropriate and ultra-comfortable. When dressing up casual pieces, don't forget the power of accessories as well. Just by incorporating a structured tote, you'll be ready to convince others that you mean business. And in the meantime, you'll feel like you barely changed out of your pajamas. It's a win-win situation. Your pants and shoes are perfect. 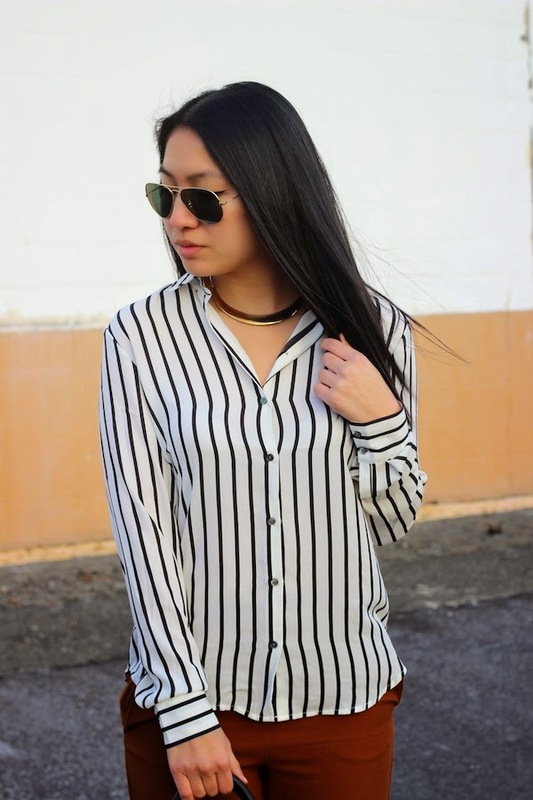 Love the stripe blouse too. You always stylish. Have a nice time. you look perfect the pants is so great, I love the color!! Thanks so much, Claire! I definitely agree with that mantra!! That color is amazing! Love how well it pairs with the stripes hun! You look so lovely! It's a perfect work outfit. I especially love the warm hue of those pants!